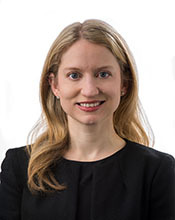 After more than 9 years working at major New York City law firms representing public companies, banks, investment managers and individuals in government and internal investigations, Jaime has brought her investigative skills to the Municipal Integrity practice of Bloomberg Associates. Jaime’s work evaluating and recommending compliance measures to clients is particularly well suited to the work of the Municipal Integrity practice. In this role, Jaime evaluates government processes in areas like procurement and business licensing to improve citizen services and reduce opportunities for corruption. She works with cities to analyze existing data and develop platforms to make information about municipal government more transparent and accessible. Using her legal expertise, Jaime works with client cities to evaluate the legal implications of and regulatory framework governing potential programs. She advises clients on how to build and strengthen their integrity programs, including training, robust ethics laws, and whistleblower protections. Prior to joining Bloomberg Associates, Jaime was a counsel in WilmerHale’s Securities Litigation and Enforcement Practice. Previously, she was an associate in the Litigation Department of Willkie Farr & Gallagher LLP. During law school, Jaime interned with the U.S. Attorney’s Office for the Southern District of New York and worked on two high profile terrorism prosecutions. Before attending law school, Jaime worked as Special Assistant to Deputy Mayor Carol Robles-Roman in the NYC Mayor’s Office. Jaime is a founding member of the New York City Legal Aid Society’s New Leadership Board. Jaime is committed to pro bono legal representation and has represented a number of indigent clients in matters ranging from appeals of criminal convictions to requests for asylum. Jaime holds a Bachelors of Arts degree in International Relations and Economics from Johns Hopkins University and a Juris Doctorate from Fordham University School of Law.